March 14, 2014 by Dreamz Unlimited! The multi-composer trend is getting a speedy popularity. Every second album has multiple composers these days. And if you observe the stats, most of the albums containing multiple composers have been big flops. Here’s another album with a melodramatic concept of Indian politics which has Jacky Bhagnani and Neha Sharma in the lead. After getting hugely popular for his singing in Raanjhana, Shiraz Uppal makes his debut in composing with two songs. Fresh from last year’s success, Jeet Ganguly has again tried to touch hearts of millions. The technical queen Sneha has a weird track and at last Shree and Ishq attempts the title track. Is Arijit being today’s Mohammad Rafi? Well, I would be glad if it happens. Yes, he actually seems to be there. That familiar feeling of a voice rendered for an ideal romantic hero. This song, in particular, gives more such feeling as Jeet’s tune resembles mid-fifties black and white era. This tune has that classic touch and yet it’s going well with the youth. Kausar has also used words like sangemarmar that are nowadays nowhere to be heard and give the feeling of an old black and white song. Both the interludes have Flute being played in 90’s style. Antara fells slightly flat but after listening it multiple times, it doesn’t sound odd. Although not a perfect one, but a slight resemblance of 50’s music made me happy. This is undoubtedly Sneha’s worst composition till date. Even a debutante would not have composed such disaster. I know she is awesome in using different and weird sounds but here, the composition sucked! It doesn’t matter if you talk about a particular version, both of them are equally awful. Ofcourse due to Mika’s vocals, his version was a better one but there doesn’t seem to be any difference in arrangements and backgrounds. And who the hell wrote these lyrics! Some Syed and Jackky himself. They can easily win the competition of writing bad lyrics. It’s an unexpected disaster from Sneha. This AR Rahman discovery, in this composition, has moved into the Rahmanian zone of Sufi Qawwali. The variable tune with a constant Tabla is the limelight of the track. It’s a very soulful composition which has been sung with sanctity. It’s very well written by Shakeel. That “Ganj bakhsh Faiz-e-Alam” sounds like pure bliss. Everything is perfect for this song. I hope it gets recognized. Shiraz is on the roll! Must Listen! A very ordinary track that doesn’t at all deserve to be an anthem. The beats and arrangements are good but there’s lack of freshness which makes the song dull and boring. It also features some dialogues by Jackky which makes it even more worthless to listen. The track is made for viewing and simply fails to make a place in audio. Composers should have given more focus to it. An anthem should be more energetic and should have “never-heard-before” sound. Needed innovation in it and that’s what it lacked. 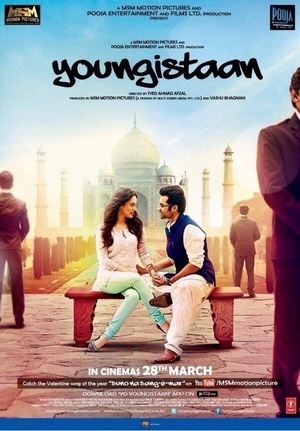 Youngistaan is a fairly good multiple composer soundtrack, that is destroyed by Sneha, then saved by Shree D and Ishq Bector, maintained by Jeet Ganguli and taken to another level by Shiraz Uppal. Sneha’s Tanki is a disaster. The title track is just a regular average effort by the composers. Sangemarmar, brings back that old black and white melodies as well as memories beautifully written and composed. The star turns out to be Shiraz Uppal who raised the bar of the soundtrack and created something soulful and heart touching. He seems to be the next big thing happening in film music. I agree, what has sneha done here?? After reading this review I can’t praise u less!